I tried listening to the audiobook at the start of 2011, but I only made it six chapters in before I gave up. The narrator was so off-putting, that I just couldn’t get into the story. Fast forward a year later, with only a few weeks to go before the movie’s release date, I picked up the paperback and decided to start back at the beginning. I fell in love with this book, as simple as that. Reading, as opposed to listening, made so much of a difference to my level of enjoyment. As for the story, I never had any of those moments where you’re left shaking your head at the pages—it was just so brilliantly well thought out. And Katniss, she was smart, a constant thinker…it’s refreshing. I know I’m probably one of the last people on Earth to read this book. I bought it at the same time that I started the audiobook, and then let it gather dust after that failed to wow me. I’m so glad the upcoming movie pushed me to find time for this. Almost everyone raves about it, so that had attributed to my extended avoidance. I generally find hype only leads to a letdown, but in this case, it was well deserved. I plan on starting the second book after I watch the movie, just because I’m weird like that. However, I doubt my willpower will hold out until after a potential Catching Fire movie has been released before I start on the final book. Despite the setup taking up a large chunk of the book, I still found it such an easy book to get lost in. The characters, both the main ones, and the ancillary, drew you into the world, gave trepidation, determination, and a wave of endurance. Even though it’s building the world, showing the characters and their lives, we’re thrown right into the turmoil. The interwoven memories allow for that character building, while keeping the tension for the main part. The actual games were more of an internal struggle, rather than a grand display of violence. Sure, it’s not a walk in the park, people die—but I liked living it, the tree-strapped naps, the daily desperation, from within Katniss’ head. How that translates to the screen will be interesting to see. I could probably go on, but like I said, I have to be one of the last people to read The Hunger Games. And if you haven’t…oh who am I kidding, I am the last. Those who want a smart leading female, and a fight for survive intertwined with unrequited romance. Great review! 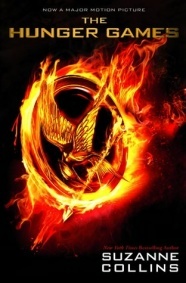 Hunger Games is one of the best series out there in YA fiction . . . can’t wait for the film! Looks beyond EPIC! Glad you finally read it and loved it, Brett! Now you can see why I’m so excited!